Sara has returned to Angel Falls. Her hometown brings back a lot of sad memories, but she's willing to undergo the heartache because her family needs her. Her Nonna has always been there for Sara and her siblings and it's time to do something back now that her beloved grandmother isn't as strong as she used to be. Working as a doctor in a small town means answering plenty of painful questions, but Sara's Nonna is worth it. Sara was abandoned by her fiancé just before her wedding and the man she blames for it is the local chief of police. Colton is her ex-fiancé's best friend and Sara lost everything because of something he organized. She doesn't think she'll be able to forgive him, but can she live in the same town as this man while holding a grudge? Colton knows everyone in Angel Falls. He's there for people who need him. He keeps an eye on troubled teenagers and helps seniors who don't have anyone strong to lend them a hand. He risks his life for others and that is a family trait. Colton isn't happy that Sara is back in town. She loathes him and he dislikes her very much after everything that happened between them. However, when they are together sparks fly. Is there a way they can change the way they feel about each other. What will happen when they kiss and make up? Then There Was You is a beautiful romantic story. Sara is smart, capable, organized and determined. I loved her fiery personality. She used to be insecure, but is learning to stand up for herself. I admired how she gains confidence and enjoyed watching her transform into a wise woman who gives everyone who deserves it a piece of her mind. Sara constantly challenges Colton. He's a true gentleman, but he isn't used to having feelings for a woman and doesn't know how to handle the situation with Sara. They're a passionate couple and their journey isn't without obstacles. They fight, they make up and they fight again. There's plenty of chemistry and I couldn't wait to find out if they'd realize they're each other's one true love before having one fight too many. Miranda Liasson knows how to write a brilliant love story. I like the way she describes emotions, she clearly understands them and that makes all of her scenes incredibly fascinating. She combines wonderful feelings and plenty of interesting layers with an amazing small town setting. Angel Falls is an adorable town. I loved the inhabitants, the buildings, the community spirit and the captivating friendships and family. Then There Was You is a gorgeous story filled with heartwarming love and affection. I highly recommend this terrific book. If you love small town romance Then There Was You is an absolute must-read. Miranda Liasson loves towrite stories about everyday people who find love despite themselves, because there’s nothing like a great love story. And if there are a few laughs along the way, even better! 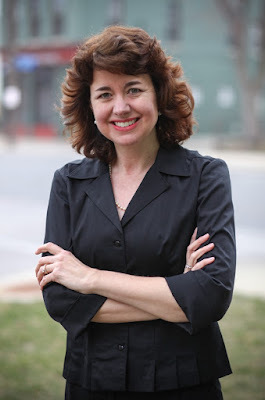 She’s a Romance Writers of America Golden Heart winner and an Amazon bestselling author whose heartwarming and humorous small–town romances have won accolades such as the Gayle Wilson Award of Excellence and have been Harlequin Junkie and Night Owl Reviews Top Picks. 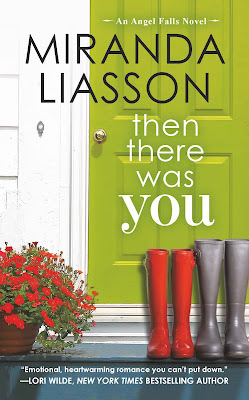 One very lucky reader of With Love for Books will receive a signed paperback copy of Then There Was You by Miranda Liasson. The emotion of the excerpt is intriguing and witty! This sounds like a fantastic and refreshing read! It sounds like a great read, thanks for sharing it. Then There Was You sounds like a great enemies to lovers story with a small town feel and the sense of family. I do enjoy small town romance. Many thanks for the good review! Sounds so great! I can't wait to read it. I agree with Miranda: There's nothing like a great love story. Reading the excerpt brought back to mind the time when my Mum started to come out of her shell. "I'm not going to be a mouse anymore" was her mantra and it worked!